Extra drawings and comics here if you want to help support the site! You could even be part of the cast! It’s hard for this not to happen. 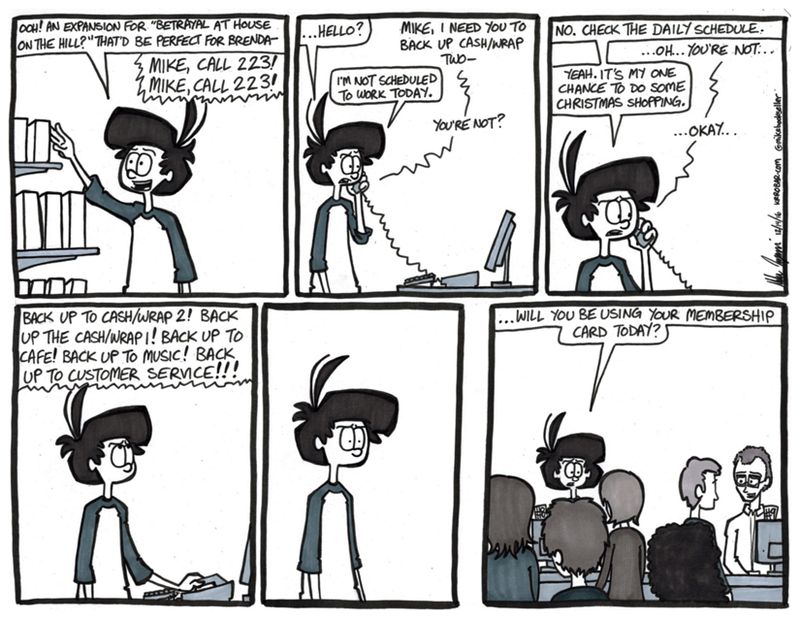 I work at The Bookstore so frequently that it’s hard to come into the store and NOT feel like I’m on the clock. I have had managers ask me to help out when I’m there off schedule too. Especially this time of year. We get swamped. People also tend to get sick a lot this time of year too. A mix of cold weather, long work hours, and ALL THE SUGARY CONFECTIONS YOU CAN EAT coming out during the Holiday Season, you’re bound to be set up the creek without a paddle. Some people who are there on their off time are saintly enough to even help out in one way or another too. We really don’t deserve people like that. You people are amazing.